The Palm Series Small Fire Pit features a beautifully sculpted design of palm trees, water and mountains creating a rustic but elegant tropical paradise. This fire pit is constructed of high quality cast resin and a 20-pound propane tank can be stored inside the fire pit completely out of view (propane tank not included). The Palm Series fire pit can also be hooked up to natural gas. You'll love the convenience of a fire anytime you want without the mess and hassle of firewood. This fire pit can be used with natural gas or liquid propane gas. Choose between realistic ceramic fire logs or 3 colors of burning glass to coordinate your outdoor haven to suite your taste. Burning glass comes in 3 distinct colors: Clear, Bronze and Smoked at an additional cost. Both the fire logs or glass will enhance the glowing, dancing flames of your new outdoor, decorative fire pit. 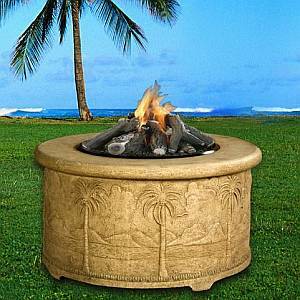 The Palm Series Small Fire Pit was designed to complete that precious outdoor living area and prolong your outdoor entertaining. Specifically handcrafted from premium quality materials selected for their ability to withstand the wear and tear of changing temperature, humidity and the outdoor elements. The highest manufacturing standards and a craftsman's eye for design and function give you a beautiful and durable fire pit that will make the most of your patio, backyard, deck or outdoor living area.